DSLR camera lately has become one of the essential requirements. The picture quality is far better than the usual pocket cameras make DSLR cameras are hunted by many people, especially those who have a hobby in the world of photography. And you certainly know the famous brand DSLR camera named Nikon. This time the review will address two of the many series that come from his camera Nikon D5100 and D3300. Check this out! Nikon D5100 sold one package along with kit lens 18-55 mm and in the design of the flip down LCD. In contrast to the previous article with competitor Canon SL1 more discuss about the quality of the lens, this time will be more discussion leads to the Interior. This camera has a small body made of plastic, motorized focus, 420 pixel RGB metering module that is ancient, the viewfinder mirror, direct access buttons and no small LCD screen at the top. In addition to the excellent screen sharpness (900 thousand pixels), the favored of this camera is the Nikon D5100 have two remote sensors, one in front and one behind. At the top there is a red button looks specifically for video recording. On the left side there is a rubber door which when opened will look like for the USB port of a few (and multifunctional AV cable), HDMI, GPS and external mic. At the bottom there is the door to remove the battery. Battery slot design is already getting better with the protection system so that when the battery cover is opened, the battery does not slide off of the camera. The offered features like HDR mode, 14 bit RAW, bracketing, various levels of Active D-Lighting and various Effect modes. D5100 also had a higher resolution sensor, higher maximum ISO, burst faster and had a sharp LCD screen and can be folded. Take a look: Nikon D5100 vs. Canon 70D. 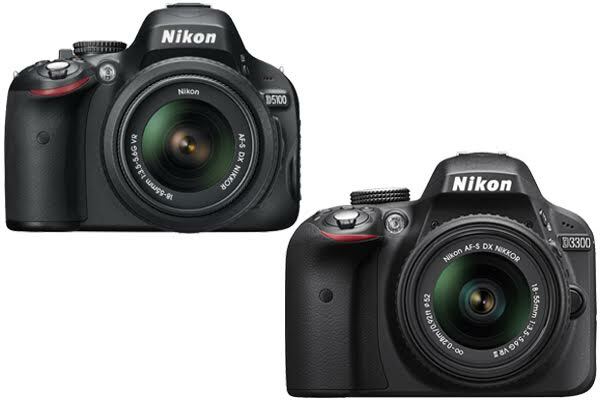 Nikon D3300 equipped with LCD screen with 3 Exquisite specification, “921.000 dots as well as aspect ratio 4:3. Standard features still exist on these cameras, ranging from the navigation buttons, Live View, Delete, Continous Brust, Play, Menu, Zoom in and Zoom out, or dial the Bracketing function for setting the Shutter Speed and Aperture. Unlike the previous series, which has effective pixels D3300 reached 24.2 MP is supported by the physical size of the sensors reach 23.5 mm × 15.6 mm CMOS. In addition, Nikon D3300 has also been equipped with the new EXPEED processor of the type 4. Prone ISO light sensitivity D3300 is still the standard. You can use ISO 100 to 12800 with clean images from noise to the number 1600. For a video on D3300, you can record HD quality video or High Definition of 1080 p that runs at a speed of 30 fps. Then, you can use different code with Nikon Lens AF-S lens or a third party with the feature built in motor. For lenses with AF or AF-D can be installed, however you will not be able to use Autofocus. By the default lens D3300 has a 18-55 mm lens features Vibration Reduction II version. If you want side-mounted tilt or swivel LCD screen with the same sensor and processing as the Nikon D7000. You can choose D5100. But, Nikon D3300 is having excellent image quality with lots of fine detail with very good high ISO performance. It is all depended on your needs.